Canada’s largest consumer woodworking show celebrates everything to do with wood for hobbyist and professionals at the Canadian Warplane Heritage Museum (9280 Airport Road, Hamilton). The Show returns for its 22nd year from February 24th to 26, 2017. 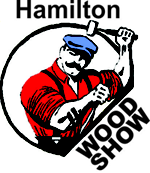 No matter what level of experience or interest in woodworking, visitors to the Hamilton Wood Show can check out the latest hand tools, power tools, design trends, finishes and wood kits. Attending free seminars and learn from the best! Special guest Vic Tesolin author of the Minimalist Woodworker, alumni and past instructor of Rosewood Studio, past editor of Canadian Woodworking Magazine and Technical Advisor at Lee Valley Tools will be down from Ottawa to pass on his knowledge and expertise in various seminars. Rob Cosman, “Your Hand Tool Coach,” returns to demonstrate woodworking techniques with hand tools. Visit www.WoodShows.com/Hamilton for a full list of free seminars. Cost: $15 Adult; $14 Senior and youth (13-17). Children 12 & under free.